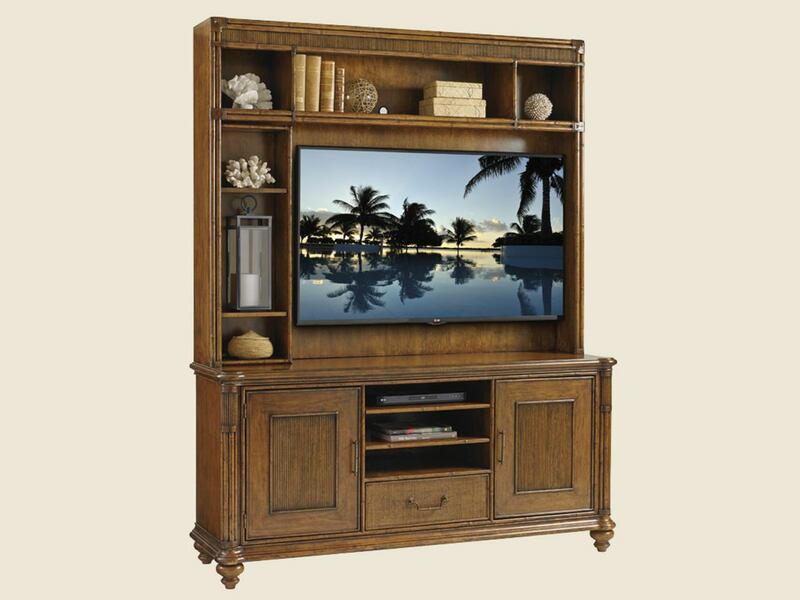 The larger of the two styles offered in Bali Hai, this 74-inch console features an open compartment in the center with two adjustable shelves and a drawer for storage. Behind the left and right doors are three adjustable shelves. Also available is an entertainment deck, with a stationary shelf at the top and a three shelf box unit that can be position on the left or right side of the cabinet. The box can also be removed entirely to accommodate large format monitors. The console will accommodate the 9000-1-BL Sligh Strong Arm TV Mount. The entertainment deck fits with the Pelican Cay media console. It features a rattan frame with leather wrapped pencil rattan accents and leather corners. It has a staionary shelf on top and grommets for electrical cords. Its three shelf box unit works on the left or right side of the deck or can be removed completely.